Otter numbers are increasing in the UK and exist in most counties. An otters main diet consists of fish which can cause a problem for open water fishing as the otter is protected. 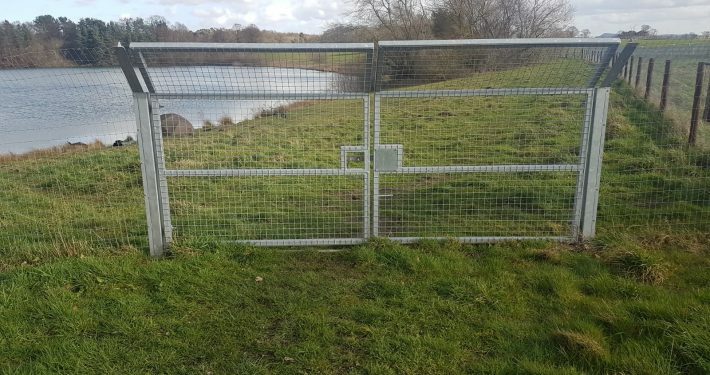 Over the years Stockdale Fencing has seen an increase in demand for otter fencing to protect lakes , ponds and fisheries. We offer a free consultation to ensure we provide the best fencing solution to help deal with the otters. To prevent otters accessing open water the best management is to put in an otter proof fence. The fence is a high tensile wire, small mesh fence. This prevents the otter from squeezing through. The fence must also be buried to stop the otter digging underneath and the top must be cranked towards the outside to hinder the otter climbing over. Special otter gates must also be installed keep otters out but to allow access to the ponds, lakes and fisheries. We supply and fit everything and with our experience you can be sure of quality and professionalism from start to finish. Otter fencing consists of high tensile wire and small mesh fence. This prevents the otter from squeezing through.